When user of your classifieds does certain actions, e.g. 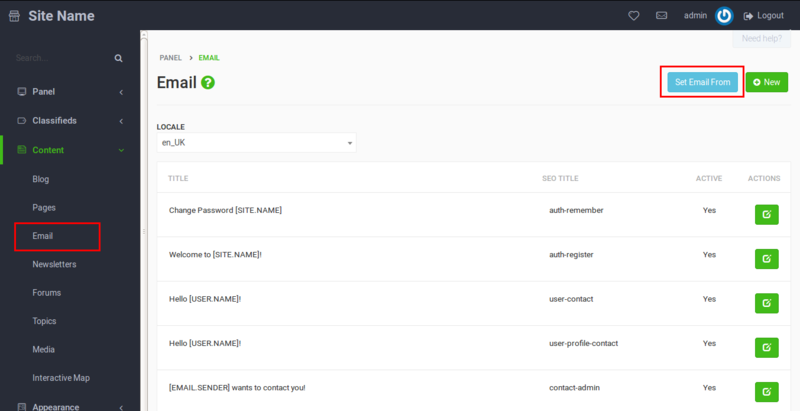 register, post an ad or request to change the password, he receives an automatic email for confirmation. To see and manage those emails go to Panel and choose Content > Email from the left sidebar. Email templates are already created and translated to multiple languages. You can Edit them according to your needs by clicking blue button next to the template. Be sure to set locale that you are currently using for your site (see: How to change language of the site?). 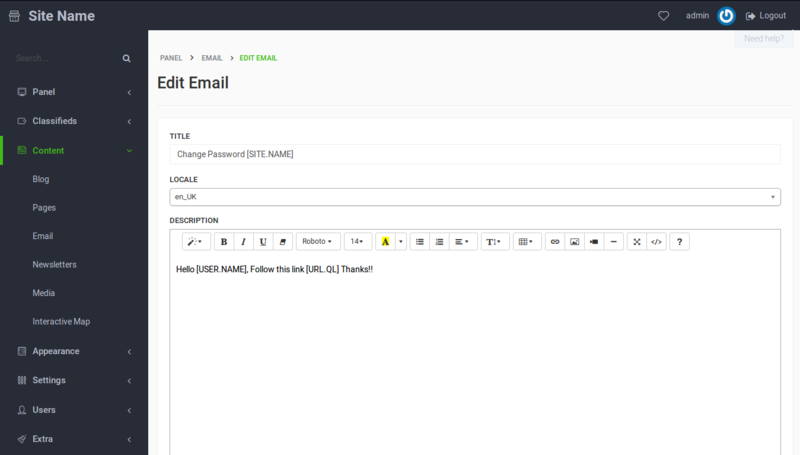 You can edit title of the email, its body and the senders email displayed. For everything to work properly you need to remember to choose the type: email and click on status check box to make it active. Message sent to inform user that his/her ad has expired. It sends that message one day after the expiration. Message sent to inform user that his/her ad is going to expire. It sends that message two days before the expiration. Message sent to inform user that he/she has a direct message. It includes the name of the sender, the content of the message and the link to this message. Message sent to inform user that he/she has been contacted regarding an advertisement. It includes the name of the sender, the ad he/she is interested in, the content of the message and the link to this message. Message sent to inform user about a new review on an ad. Message sent to inform admin about a new reply on the forum. Users that participated to the topic will get informed as well. Email sent to user with a link to pay and renew his subscription. Previously, when you wanted to replace the Email From field from all the email templates, you had to go to Content -> Email and edit all the templates one by one. Now there’s an option that allows you to change that field from all email templates directly. 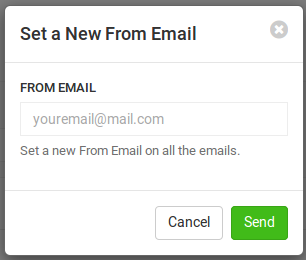 Go to Content -> Email, choose Set Email From, set a new From Email and click Send.